as the senior Cabinet colleagues like Nitin Gadkari of Nagpur have been quite vocal in distancing from the aggressive political line Modi has taken. Right from pre independence days, the political parties like the Hindu Mahasabha, Jan Sangh and even BJP which have been considered pro-Hindu or “one following cultural nationalism” were favouring alliances or Mahagathbandhan to be in power and could form the governments joining hands with the Muslim League of Mohammad Ali Jinnah (Bengal, Sindh and North West Frontier) or with the Socialist Party of Dr. Rammanohar Lohia or even the defector-Congress leaders or even the most hated Communists (Samyukt Vidhayak Dal governments in at least 9 states in 1967)! The Jan Sangh, which was considered the political wing of Rashtriya Swayamsevak Sangh (RSS) till 1977 and the pro-RSS BJP formed in 1980 following break-up in the Janata Party on “Dual Membership” issue had been in power in the alliances. Even today Modi’s BJP in power at the Centre and in various states claims to be in coalition of at least 35 parties. Earlier, the most graceful leader of the Jan Sangh as well as BJP who became the PM thrice while being the leader of 24 political party alliance! In the Indian democratic history, one would not be surprised to see the political parties changing colours to be in power. The Aaya Ram Gaya Ram phrase was coined with Bhajan Lal, the Haryana Chief Minister and Janata Party leader, merging his entire Legislative wing into Congress when Indira Gandhi returned to power in 1980 after a gap of just three years. But such drama was enacted much before in Gujarat. The Jan Sangh along with Morarji Desai’s Congress (O) and other organizations successfully agitated to get rid of Chiman Patel, who was considered to be corrupt Chief Minister. Desai sat on fast unto death to get the assembly dissolved. PM Indira Gandhi got the Assembly dissolved. Furious Patel formed his separate party KIMLOP. In the fresh Assembly election in 1975, the Janata Morcha government headed by Babubhai J. Patel, a Morarji loyalist, could be formed with the support of 12 member KIMLOP of Chimanbhai! The Jan Sangh was part of the ruling coalition and again in 1990, Chimanbhai’s Janata Dal and Keshubhai Patel’s Jan Sangh jointly contested the Assembly election and formed a coalition government till the pro-RSS party withdrew support to the Union government of PM V.P. Singh following the arrest of Lal Krishna Advani in Bihar by Lalu Prasad government during Somnath-Ayodhya Rath Yatra. The Mandal-Kamadal politics has contributed to the growth of BJP in India but unlike Vajpayee era, the Gujarat Chief Minister Narendra Modi could ride the wave of popularity in 2014 when he was the the Prime Ministerial candidate of the National Democratic Alliance(NDA) leading BJP to win 282 seats out of 543 seats with just 31.34 % votes. For the first time in three decades any political party had gained majority. Total strength of the NDA was 334. The oldest political party, Congress, was all time low winning just 44 seats. The NDA headed by BJP was on winning spree in the states’ Assembly elections having majority in 10 states and at least 12 Chief Ministers out of 31 states and Union Territories having Assemblies. The BJP managed to get new partners who deserted the Congress headed United Progressive Alliance (UPA) to be with the ruling alliance. 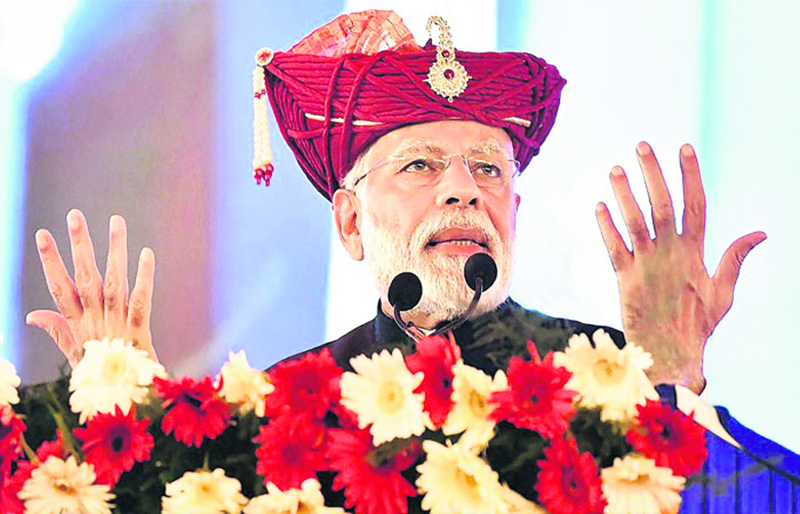 Of course, after some of the major coalition partners like Telugu Desham Party (TDP) of Andhra Pradesh Chief Minister N. Chandrababu Naidu deserting, some partners like Shiv Sena of Maharashtra ever embarrassing the PM Modi and his party, the most powerful leader Modi lost 5 states’ Assembly elections and could foresee the revival of the Congress. PM Modi is not known to digest criticism. The opposition party leaders are focusing on the promises Vs performance of the Modi government. Despite the tall claims by his army of spokespersons, the people are agitating leading to downfall of popularity of the government. It has become talk of the town that the BJP would not get majority in the May 2019 Lok Sabha election as it has lost most of the LS bye-elections and even lost the majority in the House on its own since is down from 282 to 268! Modi started feeling the heat from the opposition on various issues like Rafale controversy and Rammandir. The Gulf mega show where the largest ever crowd pulled by the Congress President Rahul Gandhi recently at Dubai International Cricket Stadium and the opposition unity show at Kolkata has sent shivers to the ruling party leaders despite they making fun of these events. Modi loyalists including Union Minister Prakash Javadekar and his Man-Friday Ram Madhav have been making statements saying if Modi voted out, there would be anarchy! The BJP is expecting Modi to form the next government with 180 seats. The hush hush in the Sangh Parivar is about Gadkari being floated to replace Modi. Former National General Secretary (Organisation) of BJP and an old RSS hand K. N. Govindacharya says in no unclear words that Modi would not be repeated. The latest Deccan Herald Survey gives only 160-175 seats to BJP and Akali Dal, JD(U), LJP,PMK, NPF with other smaller NDA allies. It gives 180-200 to Congress and DMK, NCP, RJD, JD(S), parties in UDF with other smaller UPA allies. Others are expected to have 160-180 seats. 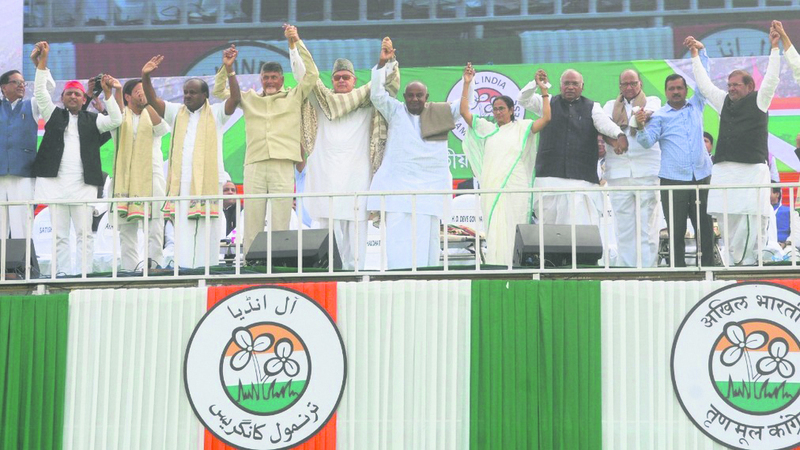 They include BSP, SP, RLD, TMC, Left parties, TDP, TRS, YSRC, Shiv Sena, AIMIM, AIDUF, AIADMK, PDP, NC, Independents and other smaller regional parties. The election dates are expected to be announced in the month of March 2019. The Aaya Rama Gaya Rama game would be on and alliance picture is yet to be clear. The BJP and NDA partners are eagerly awaiting PM Modi to do some miracle so as to come to power again. They think he is the only Taranhar. Meanwhile, many of NDA leaders await changing the track!